I put up my store years ago, but never had products up there. 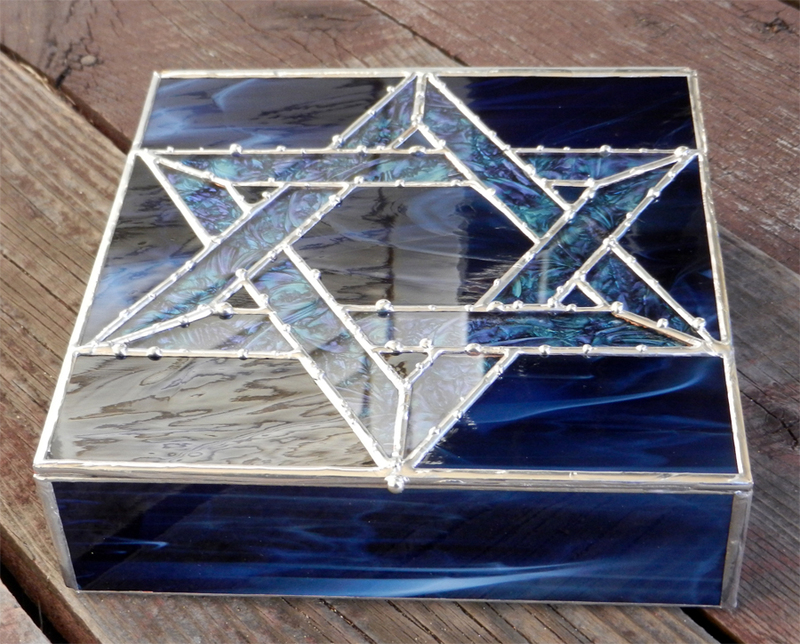 Now, making my stained glass invitation boxes IS my full-time job so the store is open! What’s in my Etsy store? I have some of my invitation keepsake boxes there for purchase, and I’ll be adding more design options each day. If you don’t see your favorite pic from my blog up there yet, please contact me either below or via Etsy. In addition to my wedding keepsake boxes and Bat Mitzvah Invite boxes, I’ll be featuring soldered and clay jewelry with fantasy imagery. You’ll also be able to find my entrapped creatures, dragons and gargoyles, Wiccan stars and some Harry Potter themed items like sun catchers and key rings. Prices range from $8 up to $50. And as always, my little 2×3 boxes which are so popular. These have dragons, moon, sun and stars, butterflies, fairies OR seashells OR pressed flowers. At only $25.00 these make great bridesmaid gifts, hostess thank you’s and are a great birthday gift. For invitation box ideas, you can browse the boxes I have shown in my blog here, or if you have a certain type of design in mind you can forward your images on to me. It usually takes me 2-3 weeks to finish, so please be patient, thanks. You can email me with questions. PRICING: The invitation boxes are usually between $125.00 – $200.00 (depending on style and features) + shipping. They usually take me about 2-3 weeks to complete once I have the invitation. Smaller boxes WITHOUT BORDER start at $95.00, wall hangings $65-$95.00. Small “hostess” size boxes start at $25.00, sun catchers start at $6.00. SELECTION: You can send me the invitation wrapped in cardboard to prevent dents. I can choose the colors or I can pick out several samples and email you pics, next to the invitation. You can pick which type of design from the various ones on different pages. Just describe it and I’ll know. For Bat Mitzvahs I can add in little charms if she has a favorite hobby or sport or if she’s doing a community service project. I also have Star of David and Hamsa charms. I make the fabric padded insert (on the box bottom) to match the colors used in the invitation and glass (these are an additional $15.00 each). SHIPPING: I wrap them in bubble, double box them and they ship just fine. You can either have it shipped directly to the recipient or to yourself. If you live in Northeastern CT, some areas of Rhode Island or some parts of Massachusetts, maybe we can come up with a place to meet instead. PAYMENT: If you order via an existing Etsy product you pay for the one you’ve selected, then mail me the invitation. If you order via my blog I set up a reserved (private sale) order on Etsy after I finish the piece. It includes several pics of the work, so you can be sure it’s exactly what you want before you pay anything. I take Paypal, credit cards with the Square, in person or by phone. Just email me to get started! Hi Anna – I’d like to ask you about creating gifts for 3 weddings. Could you please contact me? Thank you. Hi Sarah, did you get my email? I would like to place an order for a gift. Hi Marla, just checking to se if you received my email. Hi Lynn, I don’t usually treat the flowers in my designs. I DO get the leaves and other greenery sprayed green, otherwise they seem to turn right away. Yes, the flowers will turn somewhat. The ones I have are dried for at least a year in acid-free materials and kept out of the sun. In my experience it’s the acid that’s in the paper (newsprint, old phone books) that leaches into the freshly picked flower and accelerates the browning. when using acid free this doesn’t happen.I can spray the flowers but they end up with a sheen or slight spotting on them.